Philosophy, Science, and Religion / A Magazine of Success / A Monthly Journal, Teaching the Way to that Radiant Centre Within from which Any One Can So Control Environment as to Command Health and Prosperity. Washington, D.C.. Editor: Kate Atkinson Boehme, Adelaide A. Cheney, associate editor. 1/1, January 1900-5/1, May 1904(?) 8-38 pp., $1.00 a year. The journal was begun by Boehme as a simple New Thought journal of the "joy" and "success" variety, with contributions by the likes of J.F.C. Grumbine, Marie A. Walsh, Paul Tyner, William Walker Atkinson, William and Elizabeth Towne, Eugene Del Mar, and others and articles on physical immortality, realization, success, and health. Despite these rather generic examples of the of the rather softer and "affective" form of New Thought of the time, Boehme was not above the more commercial and suspect side of the movement, touting in the journal her own Radiant Success Centre ($1.00 a year), various healing and success lessons and treatments for sale by her and others, and the "splendid investment" in some forgotten stock that she recommended "in the spirit of helpfulness, because I desire to see my subscribers prosper." In the issue for October 1901, Boehme described in detail her long path through New Thought seeking health, from meeting Mary Baker Eddy, whom she thought unfeeling and repellant, to Theosophy, "hypnotism, Mental Suggestion, Faith Cure, Christian Healing, Divine Science, Christian Science, Mental Science, and, in fact, everything that had a possible bearing . . . ." "Finally there came a night which I shall never forget as it held for me a new and wonderful experience. While perfectly wide awake, and thinking out a problem, I suddenly found myself standing in the middle of the room in what seemed a substantial body, while my physical form lay stretched upon the bed. . . . What sort of self is this? Can it be a spiritual body? It certainly is not like what I have supposed spirit to be. Just then a three-tongued flame of a deep and beautiful red of peculiar color, such as I had never seen before appeared close to my left temple. I then heard myself saying, not voluntarily, but as though something spoke through me-THIS IS THE HEALING POWER. . . . This is Life itself-I have touched Life. I have been dead before and for the first time I know how Life feels." Etc., etc. With the March 1902 issue the journal became for a short period an advocate of the wonders of the international confidence man Alberto de Sarak, who had ensnared Boehme while he was in the process of creating an Oriental Esoteric Center in Washington, D.C., to promote his Order of the Initiates of Thibet. For two issues she breathlessly described his materializing in the presence of 25 people a book from her library a mile away, and being transported through the walls of a closed room, and the like. "Count de Sarak believes that he does these things by the power of Brahma, transmitted through the Adepts of Thibet." By the May 1902 issue, Boehme's suspicions of the mage had been aroused when she heard that Sarak had demanded $15,000 in Buenos Aires for a Tibetan charter and $100 in New York for the same while he (or rather the Thibetans) wanted $500 for the proposed Centre in Washington, and she had the audacity to request that Sarak give her the name of the Thibetans who wanted the money, only to be refused. She continued to profess belief in Sarak's powers-although not, perhaps, in his honesty-and promptly returned the journal to its original purposes, while Sarak started his own journal, the Radiant Truth to compete and propound his ideas. 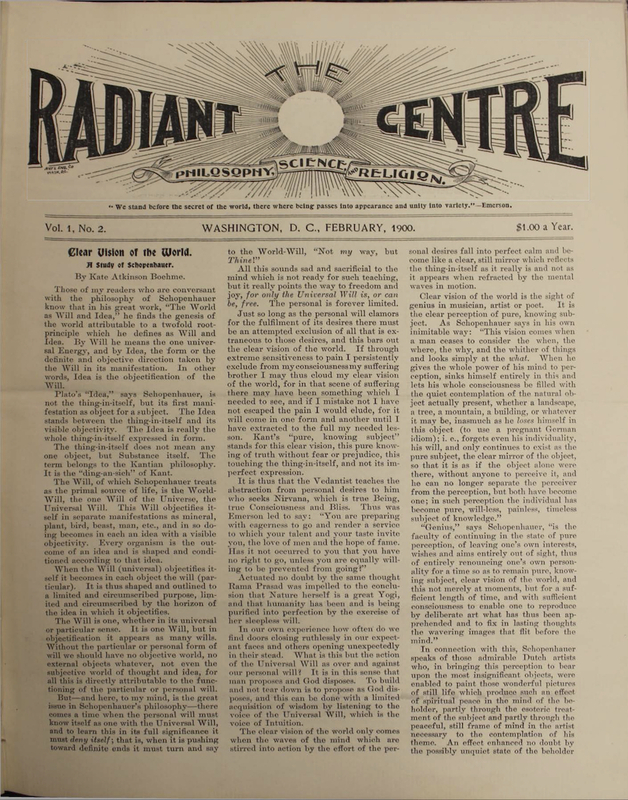 When this failed, the Oriental Esoteric Center under the leadership of Agnes E. Marsland, Sarak's secretary and interpreter, began the Bulletin of the Oriental Esoteric Center of Washington. See the notes on Sarak under L'Etoile d'Orient and Bulletin of the Oriental Esoteric Center/Society. On Boehme's disillusionment with Sarak, see Boehme, "Supreme Council of Thibet," Star of the Magi 3/10 (August 1902): 11-12. A letter from Boehme bound in with the journal at the Library of Congress informed the librarian that there had been issues published between 4/9-10, September-October 1903 and the the issue of May 1904, which began a new volume. This must mean that she published the last two numbers of volume 4 and the first of volume 5. Boehme said that she hoped to publish more regularly thereafter, but there is no indication that she did so. LOC.